This recipe was taste-tested on September 14th, 2016. In a medium pan, brown meat and season with salt. When cooked, drain in colander to remove any fat. Add olive oil to the pan and sauté garlic and onions for about 2 minutes. Return the meat to the pan, add tomatoes, basil, salt and pepper. Cover and simmer on low for at least 30 – 40 minutes. Do not add extra water — the sauce should be thick. Meanwhile, salt the sliced zucchini and set aside for 10 minutes. Zucchini has a lot of water when cooked, so salting it takes out a lot of moisture. After 10 minutes, blot excess moisture with a paper towel. In a hot pan, sauté each side of the zucchini quickly and drain on paper towel. In a medium-sized bowl, mix ricotta cheese, Parmesan cheese and egg. Stir well. 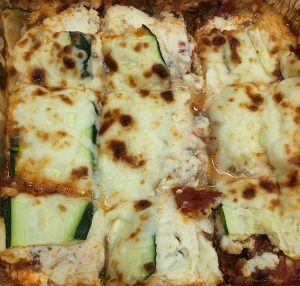 In a 9×12 casserole dish, spread 1/2 cup of tomato/meat sauce on the bottom and layer zucchini to cover. Spread 1/2 cup of the ricotta cheese mixutre, then top with 1 cup of mozzarella cheese. Repeat until you use most of your ingredients but make sure your last layers are zucchini and sauce (and you should keep 1 cup mozzarella aside). Place the remaining 1 cup of mozzarella on top and bake until melted (about 10 minutes). This dish freezes beautifully to re-heat later!